My Introduction to Wildlife was just the beginning of the journey towards our Narrow Escape, the jungle kept in store for us. We took for granted that the celebs of the jungle won’t mind our visiting their territory, so our gypsy headed for the jungle roads. Now of course as heard often, we somewhere in our mind felt that Mr. Tiger would not easily meet us, so giving even a glimpse of himself was out of the question. But then, the excitement of brushing shoulders with the wild trees, jungle roads, and the wild atmosphere itself was gripping. My cousin Nitesh, who has a passion for photography, was more than excited as he just bought a new cam and what can be better than wildlife photography to make the first click. He almost covered the entire jungle safari standing on the gypsy seat so that he doesn’t miss even a single view to capture through his lens. Our guide fulfilling his duty, (as it can be said) kept filling us with all the details of the jungle including the variety of birds, qualities of the animals, and of course some hidden aspects too (which I have forgotten, sorry). Something strange engulfed me the moment we got the permit and entered the woods. I still can’t forget the sensation that ran through me all the way while loitering around the wild greenery on either side, capturing in through my eyes all that came in. However, all way through I was wishing to get one glimpse of the one and only, Mr. Tiger. Well, I guess the jungleites got the news of our coming and so none of them came to visit us. We had to be contented with just a group of deer, some exotically beautiful birds, and few pug marks here and there. Nevertheless, the various stories of tigers, elephants, and cobras by our guide kept our excitement level on the brim. We soon realised, that we will have to contended without seeing any big animal, so finally we headed towards the exit of the jungle. Little did we know about the exit. Just as we were about to leave the jungle premises, our gypsy was stopped by a group of elephants, who just happened to emerge from the right side of the road. Enthralled, we were jumping invisibly to be lucky enough to at least get the sight of one wild animal, even if it’s just an elephant. They were four in all where three seemed to be the kids’ who crossed the road and soon got lost in the jungle on our left. While the fourth elephant, apparently either mommy or daddy, (considering its size) was the last to cross the road as if guarding its kids’ trail maintaining a distance from them. Hardly did we know that our excitement would shoot up with leaps and bound in the next few seconds. No sooner had the elephant emerged from the woods, instead of following the kids’ track, it started running towards our gypsy, just 15m away! I don’t know what was running in every mind as we all (three of us, the driver, and even the guide) were stunned and frozen with this sudden twist. I remember our guide telling us in his every story, ‘whenever an animal charge at you, the best option is to keep still and if possible even forget to breathe. I did the former as the latter didn’t strike me then or rather it wasn’t yet needed. He also told us that if angry wild elephants find a gypsy to be around, they kick it like a football. Gulped! It was difficult to imagine my gypsy flying in the air, with me, don’t know whether stuck on a tree or in the jungle somewhere. Bang! It was then when Nitesh had to do something silly. As expected. I guess it was the impact of the fear. His foot gave way making him slip in the gypsy (thankfully, not outside) making a little noise. I don’t blame him! He was standing on the gypsy seat to focus and click the elephant when it came on the road. Neither of us knew that it would start running towards us right away after stepping out from the woods. I bet if the elephant came nearer Nitesh was thinking to duck inside the gypsy! 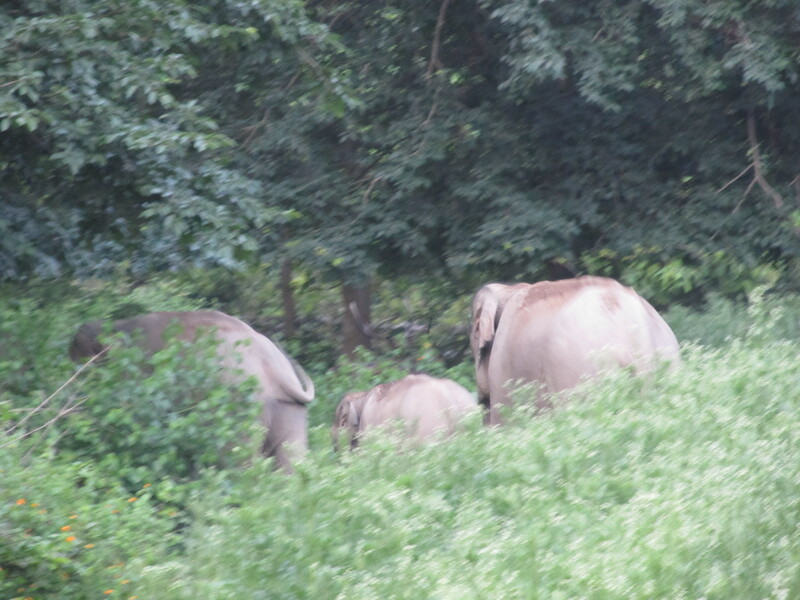 Well, this noise, in turn, seemed to send a negative vibe to the elephant and he trumpeted loudly. Reckon my heart skipped numerous beats and this was enough to glue each part of me to the gypsy. Not even a finger stirred. God! I wonder if we all were thinking on same lines “What shall we do if the elephant caught our gypsy? Shall we run? But run where? In the jungle?” My mind was jammed. I didn’t even dare to look at my actual company. All I then knew that MY NEW COMPANY WAS A WILD ELEPHANT WHO WAS CHARGING AT MY GYPSY! The distance was growing less with just 10m between us now and what the elephant did next finally took us away. 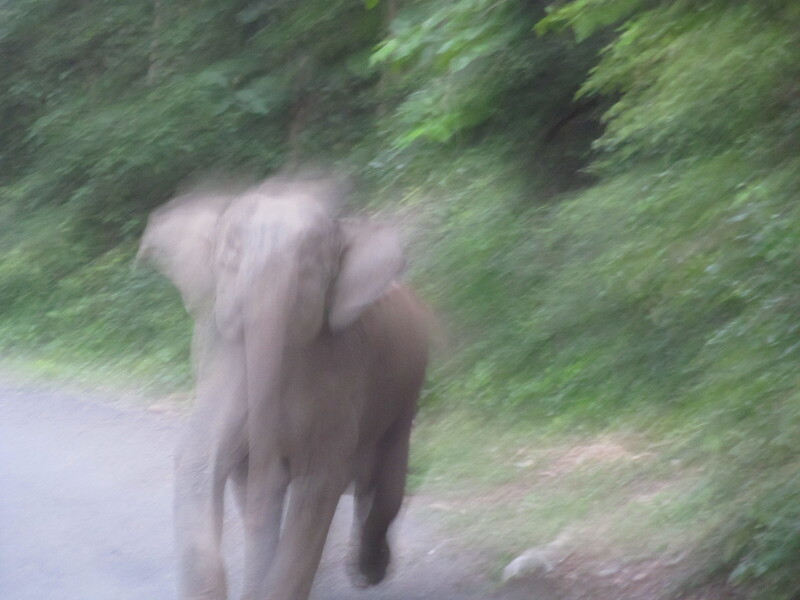 After trumpeting loudly, the elephant stamped his huge foot on the ground, making a huge swirl of dust like the special effects (even the animals can’t do without these), turned to the woods and disappeared, leaving us stunned and perplexed, but still glued. It took us some seconds to realize that we were safe and in “one piece”. In fact, what we did next, surprised us even more. We gave out a laugh about what all just happened. I noticed that the white color of our teeth matched perfectly with our white faces. However, despite the blank face and jammed mind, this experience automatically got imprinted in our minds forever. It was hard to believe that we actually had A NARROW ESCAPE! On finding our voices, both Arpit n I hit Nitesh on his silly act of slipping. Poor him, now who won’t lose balance in such situations, he’s still a kid, just completed his schooling and besides, had a New CAM. quite an experience, Rashi!I’m sure every time you will visit wild life sanctuary, this incident will keep flashing in your mind!